I have said before that I do not understand the fuss over Sebastian Vettel and it remains true for the moment. Yes, he has won a couple of races and been a strong contender this year but is his brief career in F1 really so amazing that it justifies the exaggerated praise he receives? I will admit that he goes up in my estimation as time goes on but he is still a long way from earning such descriptions as "a future champion" or "a much better driver than Button". Having said which, it seems that a few doubts are beginning to creep into some minds. For the first time, mention has been made of the fact that his wins have come in the wet and from the front; we have yet to see him make the kind of daring overtaking move that Hamilton displayed in his first year. Is he another Massa - quick on a clear track but not so good when coming from behind? It may be that Vettel will prove such doubts unfounded this season but my point is really that we do not know the answer as yet. My suggestion is merely that we retain a grip on reality when assessing the lad and avoid the exaggerated hyperbole that has been heaped upon him so far. Let him prove himself - it is no more than we ask of any F1 driver. Being dispassionately realistic, I would say that, so far, Vettel has shown us several qualities, all of them important in the armory of a world drivers champion. We know that he is quick and is winning the qualifying battle with Webber to date. That is no mean feat, given that Mark has a reputation himself as a qualifying specialist. Sebastian has also shown that he can win with ease when in the the right car and starting from pole position. What I find most impressive in his two wins, however, is his confidence when leading; on both occasions he never put a foot wrong and looked as though he had been winning GPs all his life. He is also personable, has a sense of humor and has avoided putting his foot in his mouth so far. Against that we must set the doubt over his overtaking abilities. It is not just that he proved incapable of passing both Hamilton and Trulli in Bahrain and Massa in Barcelona, it is more significant that he could not even get close enough to attempt a pass. Button had already dealt with Hamilton in Bahrain, admittedly very early in the race when tires may not have been at their best, and Webber showed in Barcelona that overtaking was not impossible. And the mention of Webber reminds us of the other rumor floating around at the moment - that the Red Bull team were not happy that der Seb had been beaten by the Australian in Barcelona. I think you're right about Red Bull/STR driver favouritsm. They played a lovely game of mental disintegration with Scott Speed didn't they? It is up to each team how they deal with their drivers but the suspicion that Vettel might be receiving more attention than Webber does put another question mark over the young German's performances relative to his team mate's. As I pointed out before the season began, the outcome of the Red Bull team mate battle it is pretty important for both of their careers - but, if it is not a level playing field, a Vettel victory would be suspect at least. Webber's starting to show himself as the master of the ballsy overtake when the chips are down - witness his around-the-outside-through-a-wall-of-spray move on Button in China, and his race defining re-take of Alonso yesterday. I read a comment somewhere wondering if Vettel has made an overtaking move. It's an interesting question, as his two wins have come from pole in the rain, when all the cars behind him are at a relative disadvantage due to the spray. He is undoubtedly a stellar qualifier, but are there question marks over his race craft? Relatively poor starts have cost him greatly this year, and he's had more than one race ruined being stuck behind KERS cars for lengthy periods. Additionally, his clumsy defence of position (and Kubica's equally clumsy attempted pass) cost him a podium in Melbourne. It'll be interesting to watch Vettel develop over the course of the year. All I am saying is that we need to see a lot more of Vettel before deciding whether he really is the best thing since Senna. On the evidence so far, he is looking good, although Jenson Button is looking better. Let us limit our praise to his actual achievements, instead of running on ahead and giving him credit that he has not earned as yet. "Button had already dealt with Hamilton in Bahrain, admittedly very early in the race when tires may not have been at their best, and Webber showed in Barcelona that overtaking was not impossible." Also worth noting that Button had the advantage of Hamilton having used up most/all of his KERS at the beginning of the lap, and so not getting the same boost as he usually would down the start/finish straight. Using it at the start line is nowhere near as useful as at the beginning of the straight. I think had he not been with Hamilton at the end of the first lap, he would've been stuck behind until the pit stops. All true, Mr Soap, which is why I qualified the example of Button's pass on Hamilton. We can never know whether Button would have succeeded had he left the pass until the next or later laps but it remains true that he passed, Vettel didn't. I would have been easier on Vettel if he had at least tried to overtake in the examples mentioned but he appeared not to have a clue how to go about it. Webber doesn't seem to have a problem in that area and Kimi certainly showed willing when he was stuck behind Heidfeld in the Spanish race. I hope you're wrong about doubting Vettel, Clive, or else this championship is as good as Button's. And what would be wrong about that, Journeyer? Button will have earned his championship if he gets it and it won't be purely from having the best car - the Red Bull is about equal now and may well get even better. The races are close and exciting so it's not as if it's the kind of walkover season that has happened in the past. I can understand you discounting Barrichello but are you sure that Webber will not enter the frame too? I find it interesting how quickly people bought into the Vettel myth. Based on two or three races he was installed as the next Hamilton. We had a discussion on a show at sidepodcast before the start of the season and everyone except me said that Vettel would get the better of Webber. I said that I needed to see more of him and I was not convinced that he would be better than Webber. I guess it happens all the time that people form opinions on drivers based on very little information. At the moment I don't think there is an active F1 driver who has proved himself to be great. That said I don't think the present formula leaves much room for this anyway. At the moment Button is winning in what appears to be the best car. I think there are quite a few who could win in this car but I see none who can bring one of the slower cars to the winners circle as I have seen a several in the past do. Interesting that you mention the Craig Lowndes fallout Clive, although I highly suspect that it was not just Marko that Lowndes has an issue with - since returning to Australia & V8 Supercars Lowndes has refused to drive for any of the Walkinshaw owned Holden teams. Indeed, he did the unthinkable for a Holden driver - and multiple champion at that - he jumped the fence to Ford. In Australia, that action is pretty much akin to suicide ! To me, seems like Lowndes has a huge issue with Walkinshaw. Perhaps the favourtism is more widespread than we think? I haven't yet watched the post race conference or read many of the post-race articles (amazing how my F1 knowledge gets neglected when I am flat out at work) but I would be very disappointed to hear that RBR was not pleased for Webber. After the hard slog he has put in over the past few years, the rotten luck, the disintergrating cars - who would begrudge him sucess at last? Least of all his team. As you say Clive, Vettel still has to earn his stripes. This is shaping up to be the best year of Webbers F1 career so far, and it would be a crying shame if RBR were to interfere with that in any way. Sadly, I don't drink their evil, foul tasting so called 'drink' so I can't voice my displeasure by ceasing to buy their product ! As a major Webber fan (which is almost mandatory seeing as I am an Aussie) I have been most impressed with Vettel this year. I thought he was very handy before the year started but he has gone up in my estimation since the start of the season and I will be happy if Webber can match him. I was starting to fear that Vettel would beat Webber comprehensively over the season until what I consider was Webber's career best drive. It has been frustrating since then that the majority of coverage and comment was on Vettel coming 4th, seemingly discounting his teammates efforts. 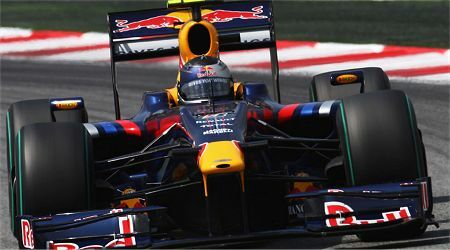 Although I understand the hype, at least in Barcelona he did not make the most of his opportunities whilst Webber did. As you mentioned on the evidence so far Vettel is looking potentially very good but he still has a lot to prove. Bring on the rest of the season I say! Steven: I too was astounded by the fervour surrounding Vettel at the start of the year. When people were talking about the best drivers on the grid, they'd mention Hamilton, Alonso, Kubica, Raikkonen... and Vettel. Seriously? He's a talent, but he's got a long way to go before he can be bracketed with Alonso and Hamilton. Steven: It is amazing how sometimes the F1 world goes gaga over a particular driver without much cause. In Vettel's case, I think his age may have something to do with it. The average age for F1 fans these days is pretty low and it may be that the young are cheering for one of their own, in much the same way that we older fans remain loyal to those who have been around a bit. Nick: Surely Alonso and Hamilton have proved that they are able to drag uncompetitive cars into higher positions than they deserve? I think these two and perhaps one or two others have done enough to be considered well above the average F1 driver. Greatness is an accolade that comes with time and they might yet make it. Peril: There is more to the Lowndes story than I had realised, it seems. Maybe Walkinshaw was the problem after all. Thanks for expanding upon the theme and bringing an Australian insight into the matter. As for Webber, I hope he does really well this year and allows the fans to get a more realistic view of Vettel's talents. Mark is no slouch and, if anyone can do it, he can! Timbo: No apology necessary, I assure you. The V8 Supercars (glorious beasts!) have made their mark on our consciousness and we know some of the drivers as a result. Frankly, I do not see why all the hype over Lewis Hamilton. Put him in a Force India car and he has yet to win a race, let alone a Championship. The fact is he was is in the best car, with the best team and accomplished what he SHOULD HAVE accomplished, given the circumstances. Put Vettel in that car, during that year and he also wins the Championship. Hamilton would not be having any more or less success then Vettel driving for Toro Rosso and Red Bull. In F1, the car is the star. I disagree that the McLaren was the best car last year - the Ferrari was, at the very least, its equal. And Hamilton is showing this year that he can get the best out of an inferior car (one that is sometimes no better than a Force India). It seems to me that he's done enough to demonstrate that he is Alonso's equal or better. Vettel just hasn't got the history yet for us to say the same of him. Yes, the car is the star but a great driver can make a difference. As you know I'm a big Vettel supporter. I will agree that the one question mark I still have about him is his overtaking skills. Other then that I have no doubts about his ability. He won two wet weather races without a mistake at a very young age. I would think that would give reason for someone to go 'gaga' as you say. I personally believe he is better then Webber, although I admit I don't rate Webber all that much. Good but nothing extraordinary. Having a guy start over 120 races without a win is nothing to write home about. Yeah I heard all the excuses about not having the right car, but when he does get the right car who beats him? His 21 yo teamate! I will say this about Webber though. I don't think he is fast but he can pass cars decisively. Again the jury is still out with Vettel in that regard. Hamilton in his rookie season matched Alonso in the same car. Hed it not been for a couple of mistakes in the last two races of the season he would have taken a championship in his debut year. No-one else has ever been close to that. When Ron Dennis announced that he was going to give Lewis Hamilton a drive the world decided that he was insane because Alonso was the next Schumacher. The fact that Hamilton drove such a highly rated driver out the door as a rookie says he is a bit special. Bear in mind that as well as winning the on track battle he managed to get inside Alonso's head in Hungary and totally de-stabilise him. He is a very special driver. Steve: In a way, I wrote this one for you - I was thinking about our previous discussions on Vettel. Much of our disagreement stems from slightly different definitions of words - it has become clear that we actually have very similar viewpoints and are really only arguing semantics. This season will give us the answer anyway! The thing that I have found interesting is that he seems to be doubted less this year than last. I seem to have spent the season telling people about Paul di Resta winning the Euro F3 championship when Vettel was his team mate. If Vettel is close to Hamilton then Ron needs to put diResta in the car. I think your conversion is complete. It may be that, now Hamilton no longer has the best car and the hype has ceased, the doubters have less reason to attack him. Just as Alonso has cemented his reputation in the past two seasons through producing results in a poor car, Hamilton is doing the same this year. I agree we will find out this season. Thanks for the Vettel article btw, I found it very interesting. As for di Resta, I'm minded of Heinz Harald-Frentzen. He was supposed to be the fastest of the young Mercedes drivers back in the early 90s. Well when they got to F1, we all know who ended up taking 7 championships. Sometimes a driver just takes a bit of time before he blossoms. I had high hopes of Frentzen when he first arrived in F1, having heard that he was quicker than Schumacher in the Mercedes sports cars. It was a long time before he found his way into a good car, however, and then the old adage proved true - nice guys don't win. Frentzen finally got a good car with the Williams but he just couldn't put it together. I'm sure with the way Williams treats its drivers didn't help him as he seemed to be the quiet, introspective type. I believe I"ve mentioned to you in the past that I'm no big fan of Willams' driver policy. I think that has been their Achilles Heel for years. I agree totally re Williams. And Heinz-Harald got the wrong right car at Williams, especially since the mechanics resented him for taking Damon Hill's seat. He was good with Jordan, a much more relaxed team than Williams and it was a shame that they never gave him a car capable of winning races. To be honest, though, I think Frentzen would not have been a champion as many times as Schumacher, no matter how good a car he was given. He lacked the killer instinct that the Shoe had in spades and was far too nice to get what he wanted by shoving other drivers off the track. So Mickey gets the championships but, of the two, who would you rather have as a friend? I agree he wouldn't have gotten nearly as many championships as Michael (if any). He was in the Coulthard/Boutsen gentleman driver mold. I always thought he would have done better at McLaren then Williams. I thought Ron Dennis would have cultivated him instead of tossing him into the deep end. Hah, so you have a price! Yes and Michael can afford it! Yes, Lowndes and Walkinshaw did have a big falling out. Something to do with promises not kept. A bit like all the creditors of Arrows. As for Mark Webber, I hope he has the season he deserves. I remember the flying Mercedes at Le Mans when he was prepared to get back in again and have another go. He's a tough and brave competitor hence the overtaking. It's amazing that in the same team one driver/race engineer combination were able to leapfrog two other cars and yet the other side of the team could only follow the Ferrari for most of the race. Perhaps that side were feeling a bit stupid. I both agree and disagree with your assessment of the Ferrari being the best car. It was the best car in dry conditions. In wet conditions, it clearly had issues. Many races were run in wet conditions in 2008 and I believe that tipped things in favor of McLaren. Beating Webber in qualify is already a big deal, in my opinion. He lacks agressivity, but hey, no one is perfect. Hamilton for instance, is agressive in excess. Botton line, I think Vettel has talent and will to become as good, or maybe even better, than Hamilton. ps: none of them is "much better" than Button. The championship leader is "as smooth as it can be", and with a steady car like Brawn he is doing something that no one else would. Well, perhaps Alonso.